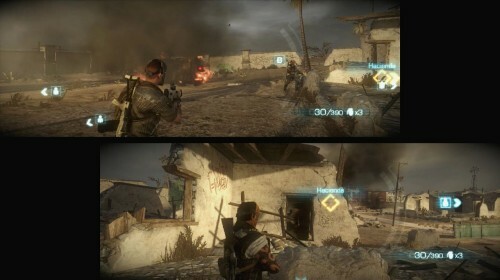 Two players can play in local split screen or online co-op through the campaign. Each player earns their own individual cash and players are rewarded bonus cash for working together. Army of TWO™ The Devil's Cartel, is the gritty third installment to the blockbuster action franchise celebrated for its intense, two player co-operative gameplay. Developed by Visceral Games™, the award-winning creators of Dead Space™, Army of TWO The Devil's Cartel re-sets the series that pioneered the co-op experience with a more intense, mature and grittier tone. Players will find themselves on the deadly streets of Mexico as Alpha and Bravo, two operatives working for Tactical Worldwide Operations (T.W.O. ), a PMC outfit that drops them in the middle of a drug war conflict for an assignment full of corruption and deceit. With the ability to unleash the power of ultimate destruction, players will need to work together as their objectives unravel, allegiances begin to blur and they face off against a ruthless opposition. This page contains co-op info for Army of Two: The Devil's Cartel on the Playstation 3. All information about Army of Two: The Devil's Cartel was correct at the time of posting. Information is subject to change. If you see any errors please email us. Page created in 0.0565 seconds.